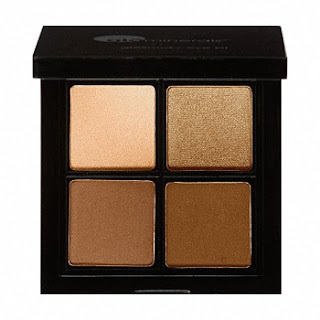 The Beauty Scoop: Get Your Fabulous Fall Smoky Eye! I will freely admit that my makeup routine is limited and basically always the same. I only recently (within the past two years) figured out how to do a somewhat smoky eye on myself. Although not fantastic, it has served me well for those oh so few...nights out on the town. So....I decided that it was BEYOND time for me to learn how to do a proper smoky eye and teach you guys (who don't already know) how to as well. My first little bit of advice is to avoid using a black shadow. This is how I attempted to learn and it was always too much AND if I made a mistake....disasterous! 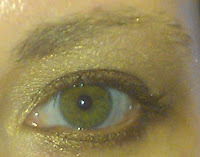 Shades of brown work much better for me and also help to make my green eyes pop. I found the perfect kit for all of us beginners and all of you pros out there. The shades of brown are gorgeous....so much so that one of our aestheticians/make up artist is in love with one of the colors and she thought she had seen every shade of brown possible! The kit is gloMinerals gloMetallic Smoky Eye Kit and I am in love! The kit actually comes with it's very own "how to" booklet....so again, perfect for us beginners. Here's a quick before picture....ignore my brows, I am in serious need of a brow wax. STEP 1: The kit contains four amazing colors....the top left is the base color (a good rule of thumb is to start with the lightest color and progessively work towards the darker). Simply press the base color into the your eye lid from the lashes to directly underneath your brow. The recommended brush is gloMinerals Eye Base Brush which is the one I used. Since it's simply covering the lid...you could really use any brush you prefer. STEP 2: Use the eye lid color (top right) and apply over the base color beginning from your lashes and then stopping just underneath the brow bone. The recommended brush is again the gloMinerals Eye Base Brush, but you could use whichever brush you prefer. STEP 3: Use the crease color (bottom left) and start at the outer edge or your eye and work the brush back and forth (kind of in a windshield wiper motion) taking the color from your lashes almost to the brow bone. You also use this color directly underneath your eye along your bottom lash line. The recommended brush for this step is the gloMinerals Mini Crease Brush, but I used the gloMinerals Smudge Brush. STEP 4: Use the liner color (bottom right) and line the upper lash line by pressing the color into the line. Follow the entire lash line from outer to inner corner. Follow the same steps for the lower lash line, but finish with gently running the brush across the line to create a smoother look. The recommended brush for this step is the gloMinerals Smudge Brush which is the one I use...you could use any smaller brush. And here's a few after pics! Just a quick side note....my hubby said the pictures do not do it justice and he LOVES it! He even had me retake the pictures with a flash to try and show off the metallic. TIPS: Especially for steps 3 and 4...make certain you gently tap your brush after you put the brush in the color and before applying to your eye. This will eliminate those nasty little mess-ups that drive us all crazy! Another tip is to make certain you have evened out your lid color prior to beginning. I used gloMinerals gloCamouflage- Golden-Honey, but another fabulous option would be gloMinerals gloLid Primer. Wanna buy this spectacular kit? For this week ONLY use code SMOKY15 and receive 15% off! This is an amazing deal since the kit is already discounted 10% for a total savings of 25%!! Don't forget...if you order $50 in gloMinerals you will automatically receive a FREE gloLiquid Lips! Yay! Glad I could be of some help. This kit really does make it easy...and yes...NO BLACK SHADOW for me. It was disasterous everytime I tried! :) Thanks for following our blog and good luck with your smoky eye! Thanks! I had one of our aesthetician/makeup artist do one eye and then I matched the other. Hope the tips help you and the kit is incredibly easy to use. :) Thanks for following!